A busy morning spent working with the enthusiastic pupils in Year 3 at Broadway Primary as the children have been learning about life in the past and exploring dinosaurs as their topic for the second part of the autumn term. This subject area links nicely into the national curriculum science element for England at Lower Key Stage 2 (Rocks, Animals and Working Scientifically). One of the aims of that part of the curriculum related to learning about different types of rocks involves explaining how fossils form and what fossils can tell us about extinct animals. The girls and boys got the chance to cast their own fossils from Everything Dinosaur’s collection and thanks to the classroom wall they learnt all about how sedimentary rocks get laid down. Can you See the Layers of Sedimentary Rocks? Can you see the different coloured bands which represent different layers of rock? The picture above shows a view of the amazing Judith River Formation which can be found in Montana (north-western United States). These rocks were laid down in layers towards the end of “Age of Dinosaurs”, near to the end of the Cretaceous Period. The dinosaur fossils we find in these rocks are approximately 79-75 million years old. Duck-billed dinosaurs and horned dinosaur fossils can be found (herbivores). There are also fossils of the meat-eating dinosaurs (carnivores) but these are much less common then the plant-eaters. Can Year 3 work out why? We can also find fossils of salamanders, bony fish, lizards and several types of crocodiles, although none of these crocodiles are closely related to the crocodiles alive today. As part of our workshop and in order to support a number of mathematical themed extension exercises, we looked at how big the teeth of Tyrannosaurus rex really are. One of the “pinkie palaeontologist” challenges we set the class was whether or not the children could use the special “greater than” and “less than” symbols we sent over to make a table listing items in the classroom that were bigger or small than the T. rex tooth they saw. Could the children think of a way to present their data? Benjamin’s favourite dinosaur was Velociraptor, he and some of his chums were shown an unusual way to measure a dinosaur. Once this relatively small dinosaur had been measured we set the class another challenge that involved them trying to measure a much larger, carnivorous dinosaur. Let’s hope they can master their eight times table, as this would certainly help! 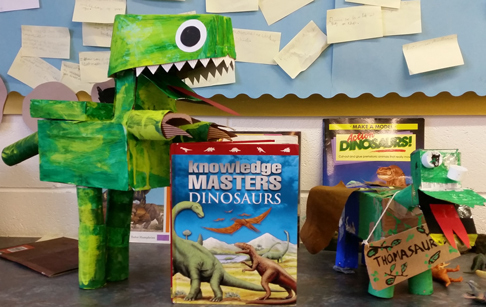 Model dinosaurs on display at Broadoak Primary School. On the classroom walls there was lots of excellent evidence of independent learning, the books at the back of the classroom had inspired the young researchers. There were also a number of wonderful dinosaur models on display. The Year 3 class had produced some excellent dinosaur replicas and we loved the “Thomasaurus”. In collaboration with Miss Heaton (class teacher), we were able to advise on further extension resources, focusing on literacy. Different types of writing activities were proposed (non-fiction and fiction) and we challenged the children to use some of the resources that we had provided to write statements about prehistoric animals and also to think up some questions to pose for us. We know Ethan and Emma have questions, we suggested that they save them in their heads and then include them in a thank you letter that they could compose and send to the Everything Dinosaur offices. We look forward to seeing some of the results of the children’s research as they study rocks, fossils and dinosaurs.